1. Preheat a baking sheet in an oven to 200°C, gas mark 6. Whizz the pastry ingredients in a food processor with 3-4 tbsp of cold water until just coming together as a ball. 2. Roll out the pastry on a lightly floured surface to the thickness of a pound coin, use to line a 24cm-deep tart tin. Place in the fridge to rest and chill for at least 30 minutes. 3. Once rested, line the pastry case with baking parchment and fill with baking beans. Place in the oven to blind bake on the preheated oven sheet for 20 minutes. Remove the parchment at 15 minutes, and continue to cook until golden. 4. Bring a large pan of water to a boil and quickly cook the asparagus for 2 minutes, until just tender. Add the peas for the last minute. Remove from the pan and refresh under cold water to stop the cooking. Place on a clean tea towel to dry, then chop the asparagus into 3cm pieces. 5. Sauté the salad onions with the butter in a small frying pan until soft but not coloured. Scatter them and the peas over the tart’s base, followed by the asparagus. Stir the cream, eggs and Gruyère together in a jug, pour over the vegetables and scatter with the chives. 6. Place in the oven to bake and set for 30-35 minutes until golden. Leave to serve at room temperature. 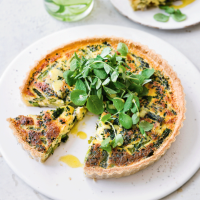 Whisk the dressing ingredients together, toss the pea shoots in the dressing and pile on top of the tart. Serve immediately.